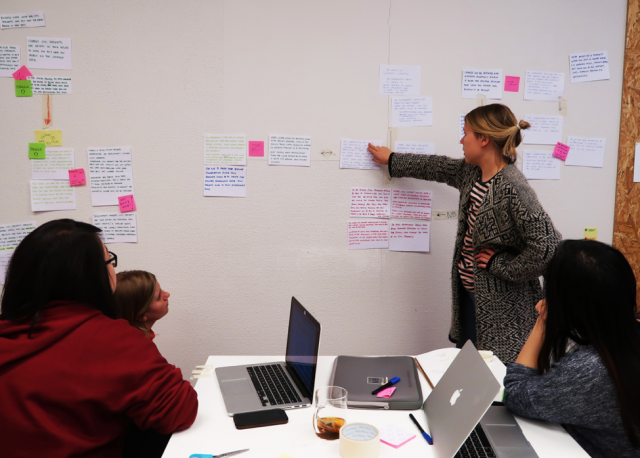 This blog post reports on work-in-progress within the DfG course! The post is written by one of the two groups working with the Ministry of Finance, Ministry of Transport and Communications, Ministry of Economic Affairs and Employment, and the Prime Minister’s Office on the brief on ‘Civil Servant 2.0: Future Work of Civil Servants’. The group includes Chinny Wong from the Creative Sustainability M.A. program, Vilma Hämäläinen from the International Design Business Management M.A. program, and Brad Mullen, Emilija Veselova, and Yuri Fukamati from the Collaborative and Industrial Design M.A. program. Since early February, we’ve been working with the project brief Civil Servant 2.0: Future Work of Civil Servants. Our ministry stakeholders are facing the need to renew the ways the government – and its employees’ – work. To help them, we had to first build a proper understanding of the situation: what are the forces behind the change pressures? What kind of future does the government envision? How to get there? We embarked on a research process, organizing two workshops, reading 12 reports and papers and interviewing 15 civil servants with the other team working on the same brief in just seven weeks. Early on, the data started to pile up, and we faced the need to start processing it. Cue: affinity diagram. Affinity diagram is a method used to distill clear insights from large amounts of data. We turned information, quotes and ideas from the interviews and workshops into individual pieces of data – over 300 in total – and then thematically organized them into clusters, grouping related ideas and similar topics together. In the process we created a shared understanding of the data, which was essential for us to move forward in the design process as a team. Video: Initial processing of our research data using affinity diagramming at A-Space in Otaniemi. After the first longer stretch of individuals interviews, we facilitated a workshop on March 22 with Johanna Kotipelto, Prime Minister’s Office, Juha Sarkio and Seija Petrow, Ministry of Finance, Susanna Metsälampi, Ministry of Transport and Communications, Kati Shibutani, Ministry of Economic Affairs and Employment, and Sirpa Fourastie, State Treasury at Valtimo, a collaborative work space for all ministries. 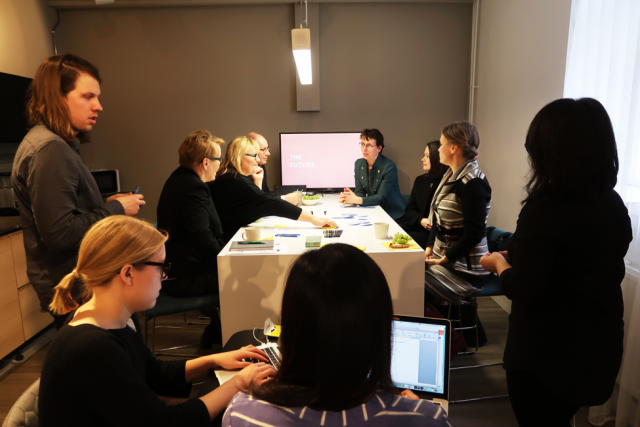 A workshop held in Valtimo, a collaborative space for all ministries, with six civil servants to discover the challenges they face and how they see the future. The topic of our workshop was “Envisioning the Future.” We wanted to get a better understanding of the context of the current experiences and challenges of a civil servant, how they saw the future and, finally, the means to bridge the two. Not only that, but also, we hoped to see how the invited participants worked together around the same table. The group dynamics of the workshop proved fruitful and one of our key insights was the lack of a unified future vision. Contradictions revealed themselves as the participants started to discuss the concrete implications of global trends from digitalization to privatization. For instance, some saw that artificial intelligence would come to handle many of the tasks civil servants have historically performed, while others argued for increased need of human touch and empathy in the government. 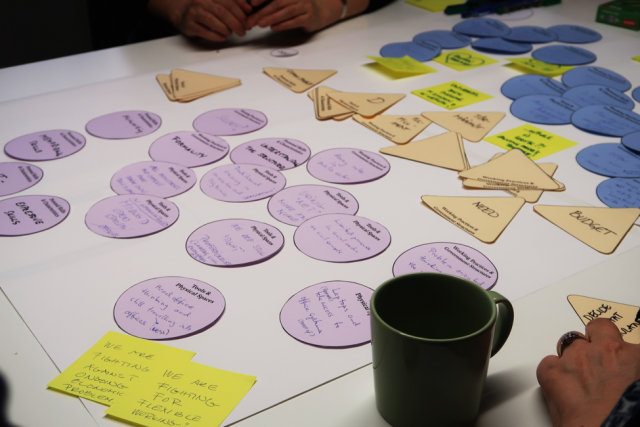 Photo of the co-creative outcome for the future civil servants’ work from our workshop in Valtimo. Another interesting insight was the topic of new ways of working. There was consensus on the increasing importance of 3-dimensional thinking; approaching matters horizontally rather than vertically, which can be described as a big shift from the traditional specialist working culture within the Finnish government. Furthermore, there was lively discussion about a talent pool and a molecular way of working. The participants painted a picture of a reserve of specialists who would come together for specific projects, make magic happen and move on to new challenges in a flexible manner. 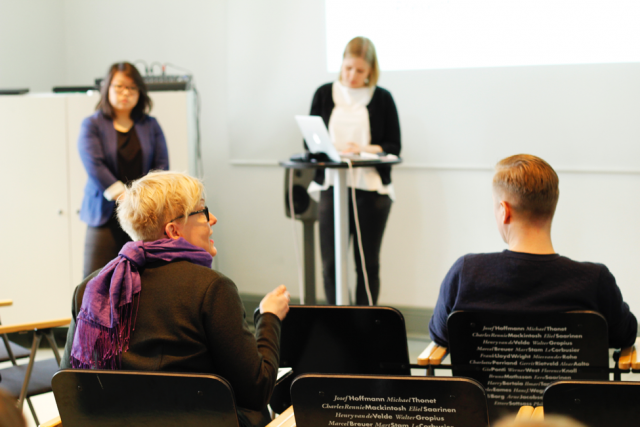 One week before our mid-term presentations we had the pleasure of listening to a visiting lecturer Tania Rodriguez-Kaarto, doctoral candidate at Aalto University, on storytelling and visualization. Tania inspired us to narrate our complex research process as an easy-to-understand story to the mid-term audience which would include client representatives from several ministries. The team structuring the insights and preparing for the mid-term presentation. On April 4 we took the stage at Design Museum and shared our key findings with the client, DfG teaching staff and other student teams. We focused on the key design opportunities in terms of the fragmented future vision, the problematic feedback loops of the present moment along with case examples of existing change initiatives within the government. Our findings sparked an active discussion with the stakeholders, and we took careful note of the expressed thoughts and feedback. Kaisa Lähteenmäki-Smith shares her feedback after the midterm presentation at Designmuseo, Helsinki, on April 4. So, what’s next? After our debrief with DfG lecturers Juha Kronqvist and Taneli Heinonen, we were able to go through our presentation’s feedback and list possible directions for our design solution. Next week, upon starting the Behavioral Insight Block of the course we’ll lock one of these directions while continuing the discovery of relevant information with different design research methods. The decision will not be easy, that’s for sure – which solutions to offer in such a complex and dynamic context? We will be sure to consider our own skills and interests, and also think of the areas where we our client could have the biggest impact. We look forward to the journey and invite you to find out the path we chose in our final presentation on May 23.